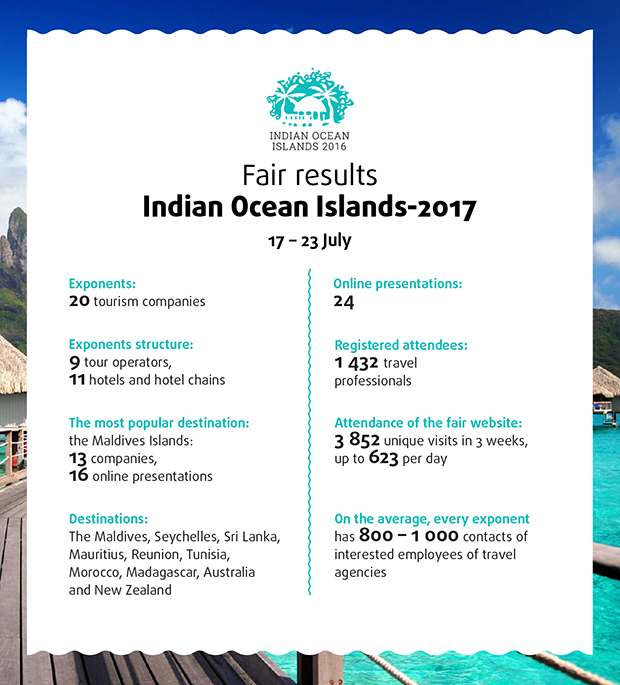 At the annual Indian Ocean Islands-2017 online fair, 1 432 travel professionals intensively learned the tourist possibilities of Indian Ocean basin: from Africa to Maldives, Sri Lanka and Australia. And we share the impressive results of the fair with you! «ART-Tour» — first tour operator, holding direct contracts with hotels and resorts in the Maldives, Seychelles and Mauritius. The destination management company in Maldives, Resort Life Maldives, has the head office in Malé, Capital of the Maldives, and also in Kiev and Mumbai. Holiday Inn Resort® Kandooma Maldives is a project of one of the largest hotel chains, Intercontinental Hotels Group. Alexey Malyshev, speaker of Anex Tour is a keen traveller — he has been to over 50 countries! The speaker of Grand Park Kodhipparu Maldives hotel, Rakmi Badr-Eddine has built his career in the international hotel chains and works in the Maldives over 7 years. The speaker of LUX* Resorts and Hotels, Natasha Webber is entitled as Africa’s most influential CMO, according to Africa Leadership Awards. As a speaker, Victoria Kolikova is presented at tree booths at a time: NIYAMA Private Islands Maldives hotel, Anantara Peace Haven Tangalle Resort in Sri Lanka and Anantara Dhigu Maldives resort. Victoria has held 3 online presentations! The speaker of the destination management company, Australian Travel Club, Marina Gomberg is a “Star of Travel.ru” award holder, mentioned for developing links with Russia and tourism to Russia and the CIS by Australian Standing Committee on Tourism. They constantly live in Sri Lanka: Alevtina Yurkovskaya, NKAR Travels & Tours, and Alexey Lutsenko, Andrew The Travel Company. The speaker of Marriott International hotel chain, Liudmyla Turovska, constantly lives in Mauritius. Regarding the results of the whole fair, we pointed out the 10 companies which hold the heightened interest of the audience. We’ve become a fair exponent for the first time, although I’m familiar with it from the very beginning and thought about participation before. The Atmosphere Hotels & Resorts is a new product, we’re the only ones who offer the “all inclusive” in the Maldives, including spa treatment, diving, lunch or dinner in the underwater restaurant. Our hotels were not much well-known in Russia and the CIS, so we had a task to bring a product to market. At the fair, we had a virtual booth with promotion and a webinar — a good chance for us to be noted. And we had a row of reservations, just at a glance — literally after 2 days we had the bookings of 3 villas. Travel agents started calling me to ask questions to gain clarity, mentioning the webinar and the web portal. the manager of “Natalie Tours” told me that they began to receive the requests from the regions such Krasnodar and Ekaterinburg. Our product is not the low-price segment, yet we see the interest of the audience that can and do sell hotels in same segment, and exactly this audience is attending the portal. In 2018, I suppose, we will take part in the fair again, especially as we have a reason — in July, the new hotel will be opened, the 4th one of our chain. — It was very nice to have the opportunity to have a chat with the hotels representatives online. I even have booked the OLHUVELI wedding hotel in Maldives during the fair, although I wasn’t familiar with it before. And I’m into tourism for 17 years! — I didn’t have a chance to join all webinars, but the information I got was very effective. I sold a tour to Atmosphere Kahifushi, Maldives after the webinar. — I attended the Indian Ocean online fair in July, now I’m joining the Arabian fair. I must say, you created such a wonderful educational format! It is handy to examine the flight program, learn the tour operators advantages, hotels highlights, tourist peculiarities and information about resorts and sightseeings — everything in one place. I’m a newcomer to tourism, working since winter 2017, but I’m sure that the experts are appreciative also! The fam trips are useful, but it’s not possible to join them every year to every country. And you still want to know more about new hotels and renovations, tours and offers. The most favourite tradition of Profi.Travel online fairs visitors is the lucky draws of attractive prizes. Since this year, the Profi.Travel Loyalty system was launched to help the visitors to gain scores and win prizes. and most importantly — take part in the final testing: to answer all 10 complicated questions correctly in 20 minutes and confirm the knowledges gained in the fair. With the help of randomizer we chose a winner among travel agents who did all steps and gained the maximum scores. The winner is Sergey Peremutov, “More tour” company, Yaroslavl. The hotel chain, Lily Hotels, had also a set of 2 super prizes up for grabs: accommodation vouchers in Maldives hotels of the chain. To get the prize, one should answer all quiz questions about hotels offers. 150 travel professionals attended the quiz. As the result, Anna Batagova, “Ekipazh” travel agency (Yaroslavl) will visit Lily Beach Resort & Spa 5* for 2 nights. And Elena Sibirtseva, manager of “Stil-M”, Kiev, will spend 3 nights at Hideaway Beach Resort & Spa 5*. All travel professionals who attended no less than 3 online presentations will get branded diplomas for the successful destination learning and can download it in their personal accounts, print it and hang on the wall to demonstrate them to the clients.